Magna Housing entered a team of six runners, three in each race. Catriona Fountain, Magna’s Head of Communication, said “As this was the first marathon or half marathon for many of us, it was going to be a big challenge, so we decided we wanted to try to raise money for a charity while we were training. We chose Weldmar because it is a local charity and relies so much on public donations. We are very proud to have raised so much money and are hugely grateful to everyone who has sponsored us. “We started training properly at the end of last summer. We’d all go out running together at lunchtime round Dorchester and then at the weekends we’d go for long runs, gradually building up the distance. We were very lucky that one of our staff, Becky Alford, is also a UK athletics coach so she came out with us once a week to help with our training. She also gave us invaluable advice as we went along about nutrition and the importance of rest before the race. 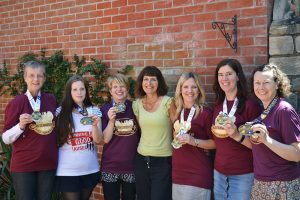 “We all had an absolutely fabulous time, we enjoyed training together and the event itself was amazing with so many people cheering us on. We hope we might have inspired others to give running a go as they have seen how much fun we have had. So we’ve started another running group at work to get people running who have never done anything before”. The team has so far raised over £900 – and you can learn more about them and sponsor them on their JustGiving page. 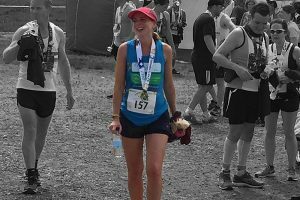 Kate was asked to take on the Casterbridge Half-Marathon by her Dad, who was a patient of Weldmar Hospicecare’s. Kate said “From the moment Dad was in Weldmar’s care, his dignity was restored as was his faith in human kindness. Nothing was too much for them, everything done with compassion and care and as his daughter, this meant more than words can express. Because of the care received at Weldmar, my gentle Dad slipped away with as much dignity and as little pain as was possible, a comfort that his family will forever be grateful for. I would love to say that running the half-marathon was my idea – but Dad asked me to do this a week before he died – no pressure!”. Kate completed the race in 2:22 – and you can learn more about her, and add to her amazing fundraising total of almost £1,400 on her JustGiving page. Daisy entered the Dorchester Marathon to raise money for Weldmar because of the care we gave to her godparents. Daisy said “My godfather spent some time at Weldmar and it was thanks to their excellent care that he was able to return home. They were able to offer help throughout the rest of his illness which allowed him to stay in his own home, which meant so much. Whenever I spoke with my godparents I was regaled with tale of how wonderful Weldmar had been, the food, the people and the kindness. I completed the marathon and had sore legs, but I was very proud. My godmother was able to come down and see me which meant the world”. Daisy completed the race in 5:23. 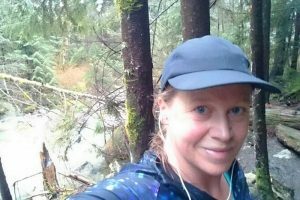 So far she has raised £610 for Weldmar – and you can support her and learn more about her on her JustGiving page.